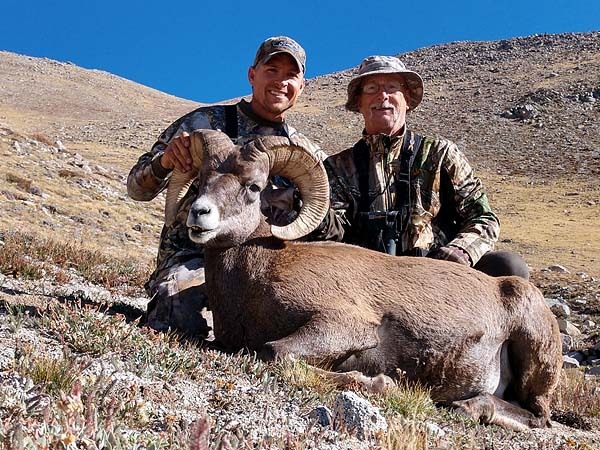 "Kyle's High Country Bighorn Score"
Kyle McCarthy writes, "Well, this year I finally drew my Colorado Rocky Mountain Bighorn Sheep tag. After 3 months of planning, scouting, phone calls, map studies and several gear purchases the day to leave was finally here. I almost wished there was more time. We left Aug. 31st and the trip did not start off well. I blew a head gasket in my hunting rig, so had to switch trucks. But, we got into the area just before sundown and set up base camp at 9500 feet. Left early the next morning and hiked to 10,800, but had to find a new route, as the bush whacking and terrain got too steep. We made it to our spike camp location after 9 hours of hiking. We still weren't in sheep country, but close. The camp was at 11,200 feet. The Sept. 4th opening day came fast. To date, I had only seen ewes and lambs and not a single ram. We left camp early and at about 8 am we found a band of rams on a cliff at about 12,800 feet. I spotted the ram I wanted and ranged them at 1200 yards. We had lots of ground to make up fast, and that's just what we did. 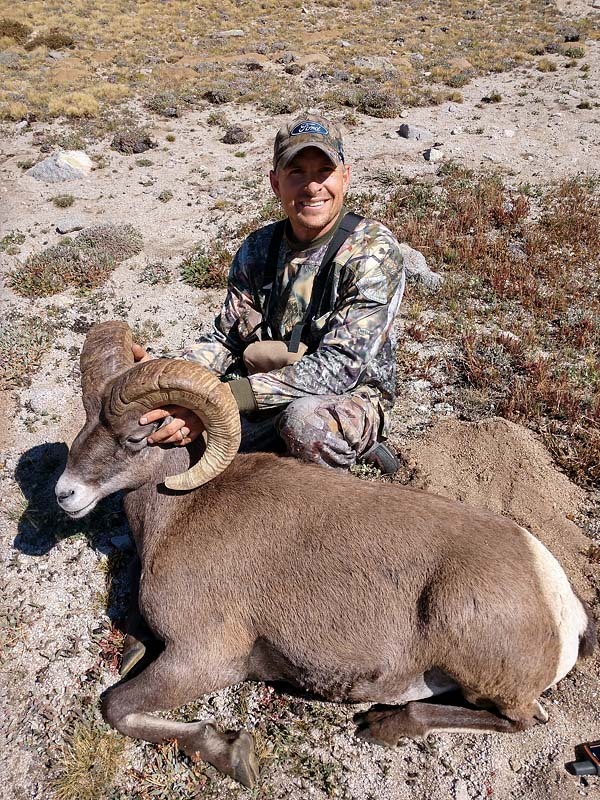 I got to within 550 yards and watched to relocate the ram I wanted to take shot at. While watching, they all came down off the cliff to an alpine meadow. 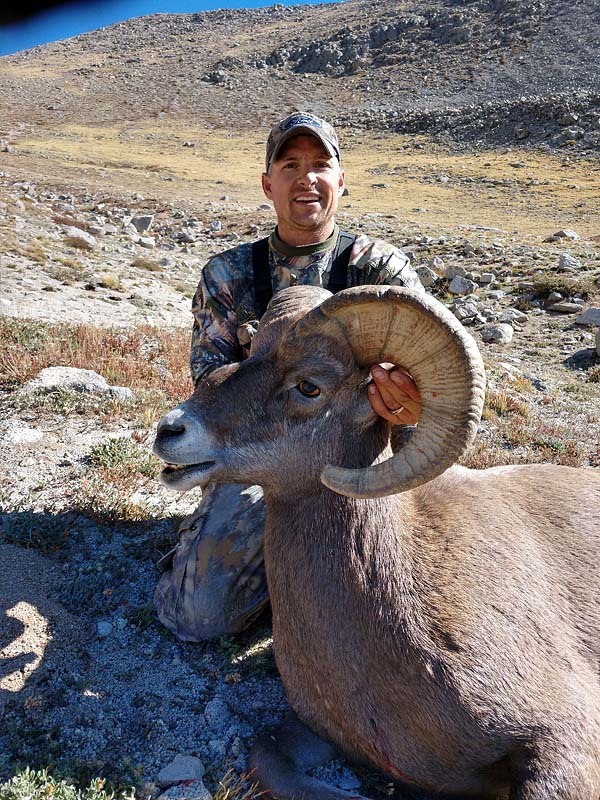 I ranged them again and at 354 yards there was the ram I had been dreaming about for so long. The shot rang out in the high mountain cliffs and they took off. My uncle had glass on them and said, "he must be down, all the others are leaving and I don't see him". After a very fast paced walk up the steep ridge, there was my once in a lifetime trophy. With 7/8 curl and 14-1/2 inch bases and 28 inch horns, he truly is a beautiful sight. Would like to say thank you to my uncle, Danny, for all his help on the hunt and my wonderful wife, Jenny, and my kids, Rylea and Rhett, for their support."